This Pre Shave Oil by Gentlemen's Tonic helps to prepare and protect the skin before shaving, softening the hair in order to give you a close and comfortable shave. 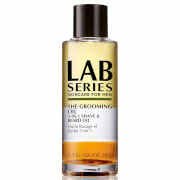 This oil is the perfect addition to your daily shaving routine. Grape and Sunflower Seed oils are high in Vitamin E, light, easily absorbed and non-sticky. Wheat germ Oil is high in antioxidant vitamins A, D and E which improve circulation within skin and are anti aging. Jojoba Oil is highly absorbent and contains a wax which mimics collagen of skin (anti-aging). Avocado oil – high in antioxidants, prevents dryness and dehydration of skin. Black Sesame oil is a great skin rejuvenator and razor burn protector. Contains phytate, the most powerful antioxidant in nature. Borage oil –regenerates and stimulates the skin, contains GLA which reduces irritation, itch and roughness of skin.